My best girlfriend turned me on to this book not long ago. 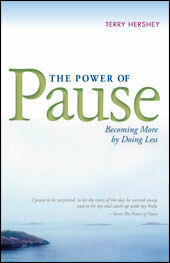 And because The Power of Pause is designed like a devotional I haven’t read much of it yet… thus the preview vs. review. However, so far I am quite impressed with Terry Hershey and his book. With our daily schedules getting out of hand, we need all the help we can get to slow down! Rather than go on about how good I think this book is going to be, I will let the author tell us himself. Previous PostPrevious Living Life Lessons :: UNLIMITED ACCESS!